April 15, 2019, 3:00 p.m.
CBD oil is derived from the cannabis plant, but clinical researchers have found that CBD doesn’t induce psychoactive effects – in other words, users don’t get high from it. Rather, it can potentially be used to alleviate pain, reduce stress or anxiety, and treat insomnia, according to various clinical studies. Who is using CBD products? 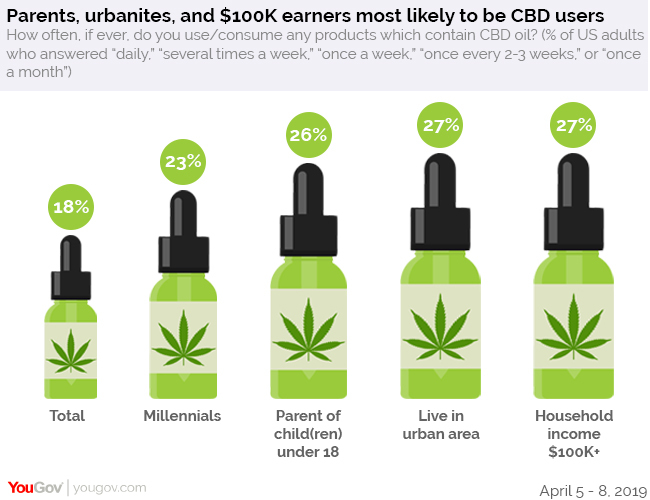 Millennials (23%), those with have children under 18 (26%), people in urban areas (27%) and those with a household income of $100K or more (27%) being especially likely to use CBD products at least once a month. Even those Americans who aren’t currently using CBD products may be in the market soon. Roughly four in ten Americans (38%) say they would be interested in eating or drinking something infused with CBD oil, while a similar percentage (40%) would be interested in using another CBD product, such as a CBD-infused lotion or bath product. Women (46%) are considerably more likely than men (34%) to say they would try products infused with CBD oil, and slightly more likely (41% vs 36%) to say they would eat or drink something infused with CBD oil. Parents with children under 18 years old are especially likely (50%) to say they would eat or drink foods with CBD oil, and more likely (51%) to say they would try other products that contain CBD oil. Where CBD leads, marijuana may follow: A majority of Americans support legalizing cannabis use – in some instances. 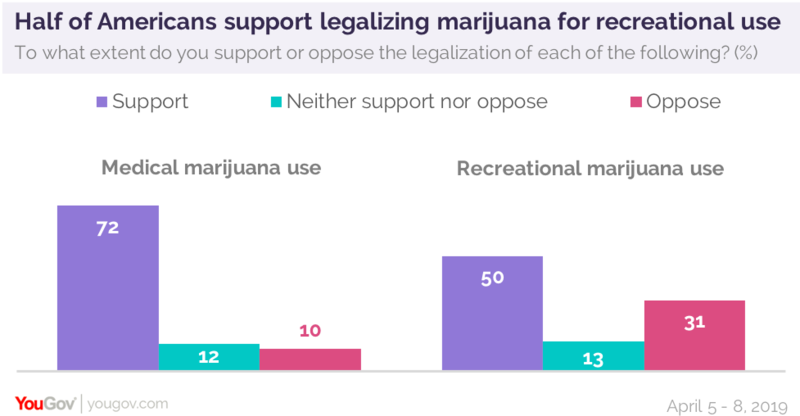 Most Americans (72%) support the legalization of medical marijuana use, while half (50%) say recreational marijuana use should be legalized as well. People who have ever used marijuana recreationally are especially likely to support both legalization of medical (93%) and recreational (86%) use. Currently, marijuana is legal for recreational use in 10 states, and approved for medical use in 33 states. A majority (62%) of Americans say they expect that marijuana use will be legal everywhere in the US within the next 10 years. Those who have ever used marijuana recreationally are particularly likely (89%) to believe it will be legalized everywhere within 10 years’ time. Attitudes around marijuana tend to be more positive than negative. Half (52%) say marijuana is less harmful than alcohol, with nearly six in ten millennials (59%) and 87% of those who have ever used marijuana agreeing with this statement. A similar number of (49%) people say they prefer using natural remedies rather than pharmaceuticals for medicine. Methodology: Total sample size was 1,269 US adults aged 18+.The responding sample is weighted to the profile of the sample definition to provide a representative reporting sample. Interviews were conducted online between April 5 – 8, 2019. Learn more about YouGov RealTime research and sign up to be a panelist here.